Finding inner peace can be a daunting task, especially if you are a celebrity living in the bright glare of the limelight. 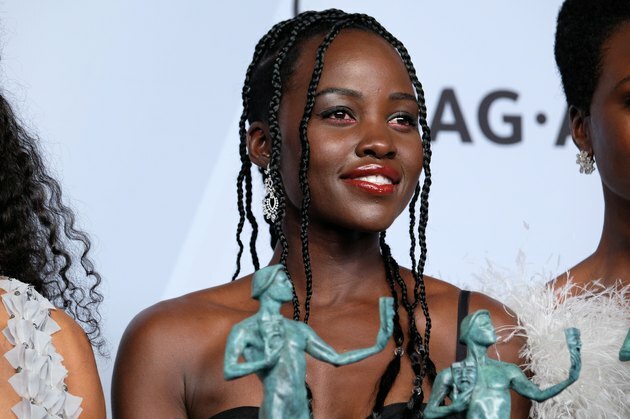 Academy Award winning actress Lupita Nyong'o has struggled with the art of meditation for most of her life, so for her 35th birthday, the star of Jordan Peele's upcoming sophomore film "Us" decided to gift herself with a heavy dose of zen — a retreat, consisting of 10 entire days with absolutely no talking. "Meditation is something I've always been interested in. It always has felt a little mysterious and out of my reach. Right after 'Black Panther' came out, the day after the Oscars, I went on a 10-day silent retreat," Nyong'o tells Marie Claire in her new cover story about the experience, which was a birthday gift to herself. "It was the best gift because, the thing is, my job has two main parts. There's the acting, and there's the celebrity," she explains. "And the celebrity involves a lot of giving. After talking so much, and just expend, expending, expending, to sit with myself and just listen. Our lives are so full of distractions; you go from one distraction to another." The retreat, which took place in Texas, wasn't easy for the star. Even when urges to escape arose, the actress couldn't, as she had forfeited her phone, didn't have a car and had also signed an agreement to stay the entire 10 days. "I was constantly wanting to leave and then daring myself to take one more hour and another hour," she admits. "And oh my God, it was crazy and beautiful, because after the 10 days, it wasn't talking that I missed." She explains that the "heart of the program is about unclutching from attachments to pleasure and aversion, the idea that we attach to things that we love and to things we dislike. And our identities are built on assembling these things to basically write the stories of our lives, but learning to unclutch from that control makes it easier to live, to exist." After Nyong'o completed the program, the friend who recommended it suggested she listen to an album that she loves. So on the flight home she listened to Kendrick Lamar's album "Damn," and it was a transformative experience. "Usually I listen to music and it's backdrop. But after that retreat, I was able to focus solely on that and for it to fill my existence in that moment," the 35-year-old says. "I loved the music, but rap sometimes comes at me too fast and I'm not really able to hear it fully. But this time, I heard every word Kendrick Lamar said. I heard the musicality. I heard instruments I'd never heard before. It was like clarity. And I was just, like, wow. I imagine that people sometimes get that from drugs. But it was really nice to get that just from spending time with myself." In case you curious exactly what a silent retreat entails, one Well + Good journalist, Erin Bunch, recently detailed her experience — and it was no joke. First off, she explains that her five-day retreat involved intermingling with 15 strangers (who she couldn't even talk to) and sharing a room with one. All of her technology — phone, computer, etc. — was taken away from her. Her days involved vegan/gluten-free meals, non-guided meditation and Buddhist/mindfulness reading and "talks" with the retreat's leader (the leader talked, the rest of them listened.) Even non-verbal communication, like smiling and making eye contact, was discouraged. "Reading was okay so long as the material was practice-based, and writing was acceptable as long as it did not devolve into a form of entertainment," she wrote. While it might sound tortuous, Bunch claims it was "cathartic" and that the leader basically "re-parented" her over the course of five days. "Her myriad healing words — three to four-hours worth of them per day for five days — are now etched into my brain, and whenever I think about her I, gulp, instinctively put my hand on my heart," she wrote. The journalist continued to explain that mindfulness practices "center around drawing your focus away from the past, which can be depressing, and the future, which can be anxiety-provoking, and into the present moment, where everything is generally a-okay." "They also tend to involve the practice of self-compassion, which in turn leads to greater compassion for all beings, which in turn just makes life better for everyone involved, especially you." Bunch also pointed out that the experience gave her a "strong sense of community," as she coexisted and developed care and concern for her retreat-mates without speaking. Additionally, it made her more mindful about technology, though she admit she regressed back into many of her old habits soon after. While going on a silent retreat isn't realistic for everyone, incorporating meditation and mindfulness into you daily life can be beneficial in a variety of ways. Multiple studies have linked mindfulness practices to stress reduction, even decreasing our levels of the stress hormone cortisol. It can also improve the quality of your sleep, help you recognize your thought patterns and subsequently break bad habits and help you be a nicer person in general.